Heads of Los Angeles City departments and community groups joined faculty and students in brainstorming ways to rethink historical preservation amid gentrification and urban change in December as part of the USC Sol Price School of Public Policy Race, Arts & Placemaking (RAP) initiative. 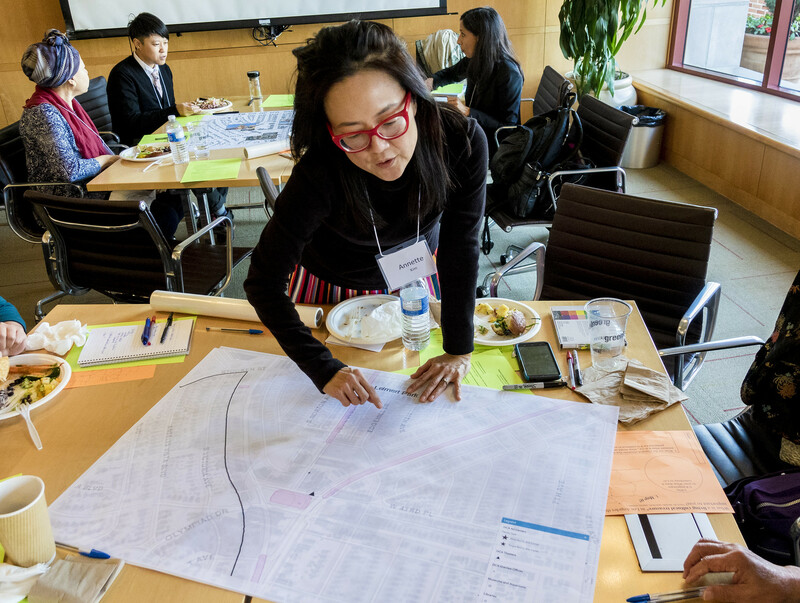 The Mapping Cultural Inclusion in Los Angeles workshop was convened by USC Price Associate Professor Annette Kim, who leads RAP, and her RAP collaborator, Karen Mack, executive director of LA Commons. The workshop’s goal was to identify and flesh out possible strategies for incorporating “living cultural treasures” and the everyday culture existing in a city into how urban redevelopment happens in L.A.
Kim provided examples including Mariachi Plaza in Boyle Heights as a culturally relevant practice, and a small business in Little Ethiopia that rents space in an insignificant property but has become part of what makes the area culturally significant. “It’s about democratizing heritage because so far there has been a limited number of heritages protected, so there’s a movement to include other groups and heritages,” Kim said. Among the 25 people attending the workshop were Vince Bertoni, director of the L.A. Department of City Planning, Danielle Brazelle, general manager for the L.A. Department of Cultural Affairs, and Ken Bernstein, manager of the Historical Resources Division for the L.A. Department of City Planning. Bernstein added that the city will continue to have conversations on the topic with community leaders in the hope that it will lead to new initiatives, such as a suite of programs and incentives that could give greater meaning to the idea of cultural districts in distinctive neighborhoods across Los Angeles. “It feels so great that we have city leaders who totally get this and are concerned about this,” Kim said. Jonathan Crisman, a PhD student in Urban Planning and Development, co-led an introductory exercise on living treasures and a mapping exercise on how cultural assets maps created by USC Price students with LA Commons and the Alliance for California Traditional Arts could intersect with city planning maps. “I was so excited to participate in and help set this meeting up,” said Crisman, who is writing his dissertation, under Kim, on the role art can play in civic engagement and participation, with Little Tokyo as his primary case study. One potential strategy that emerged from the meeting is for the city to explore creating its own cultural districts, which is now a state-level program (Little Tokyo and San Pedro are the two local designations). Another idea was to catalog living cultural assets into a city database that could be referenced during the urban development process.